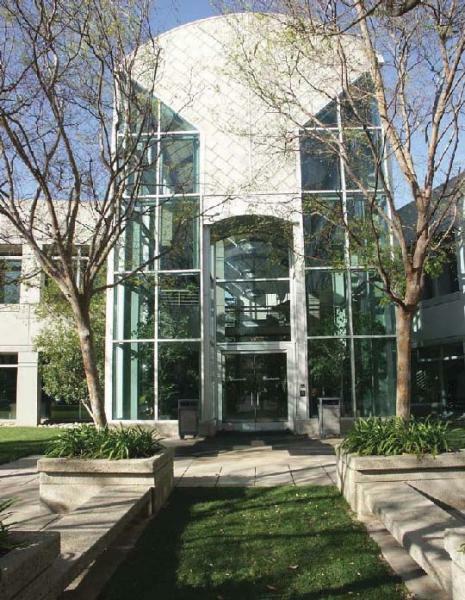 Younan Executive Center is a two-story, 63,305 square foot, Class "A" office building located on Madera Road in the Los Angeles submarket of Simi Valley, CA., which is cited as the nation's seventh safest city according to the FBI. Visitors are welcomed as they step into a dramatic entry with a soaring two-story lobby complete with high end finishes. The building is designed to easily accommodate a single user or can be efficiently demised for multi-tenant use. The window line throughout the entire building offers majestic mountain views. With a full service 1,400 square foot cafeteria and 1,500 square foot dining room, Younan Executive Center provides important amenities for a 21st century company including a fully outfitted media/training room, data room with 18-inch subfloor and plug and play workstations already in place. There is an outdoor dining patio for relaxing and nearby walking and running trails. The building includes an executive wing with private executive offices, a private garage, board room, fully outfitted kitchen and private koi pond off the wing. The building sits on 6.3 acres of a park-like campus and is professionally landscaped with mature trees and bushes. The property has immediate access off the 118 Freeway and is minutes away from restaurants, shopping, banks, dry cleaners and grocery stores. Younan Executive Center is a 15 minute drive from Westlake Village and the West San Fernando Valley areas. Second largest metropolitan economy in the U.S. If the five-county Los Angeles area were a state, it would be the 4th largest in the U.S.
L.A. has more museums than any other city in the U.S.
L.A. is the largest international trade center in the U.S., and the Number 1 import/export port in the U.S.
Los Angeles County, with 9.81 million residents, is the most populous county in the U.S.